On an edenic island hidden from the rest of the world by magic lives a society of Amazon warriors. They are ruled by Queen Hippolyta (Connie Nielsen). Her sister Antiope (Robin Wright) is the best warrior on the island. Nielsen is often shot on horseback, in long, fur-lined robes, braids and gold softly framing her face. Every bit of her bearing is regal. Wright is introduced in the middle of sparring with an opponent, the muscles in her arms flexing and the thrill of the battle on her face. And yet the two are more well-rounded than their defining character traits. Hippolyta is just as capable of lifting a sword and charging into battle. And Antiope is kind and capable of comforting a child and even has a discreetly implied (frankly too discretely) relationship with another Amazon. If there is disagreement between Hippolyta and Antiope it is over what is to do be done with the only child on the island, Hippolyta’s daughter Diana (eventually played by Gal Gadot). 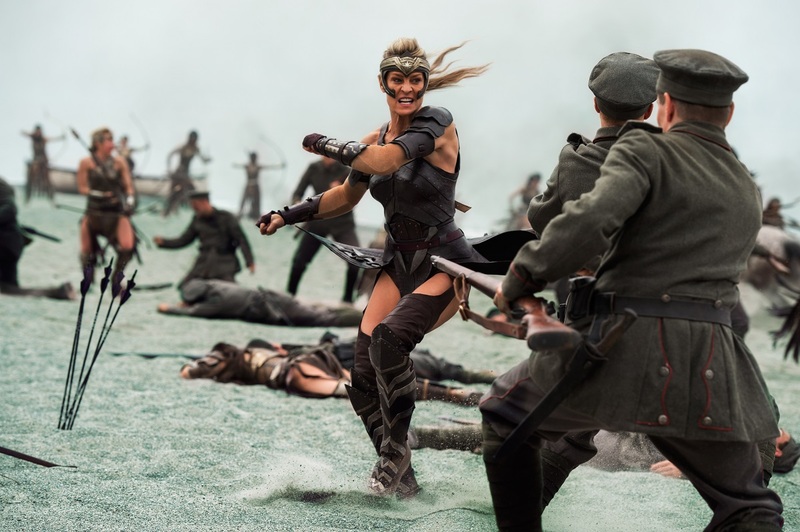 Antiope notices the young princess’ fascination with the fighting that the women do as part of their daily training and wants to start teaching Diana. Hippolyta refuses at first. This island was a haven given to the Amazons by Zeus and Hippolyta hopes Diana will never know the horrors that lie beyond it. Hippolyta loves her daughter and her reluctance for Diana to train with Antiope is not dismissed as the awful buzzkill female relative who hates heroism and fun. But rather her position is framed as a mother who has well-founded fears for her child’s safety. Hippolyta eventually relents, and Diana grows into a mighty warrior who starts itching for adventure. 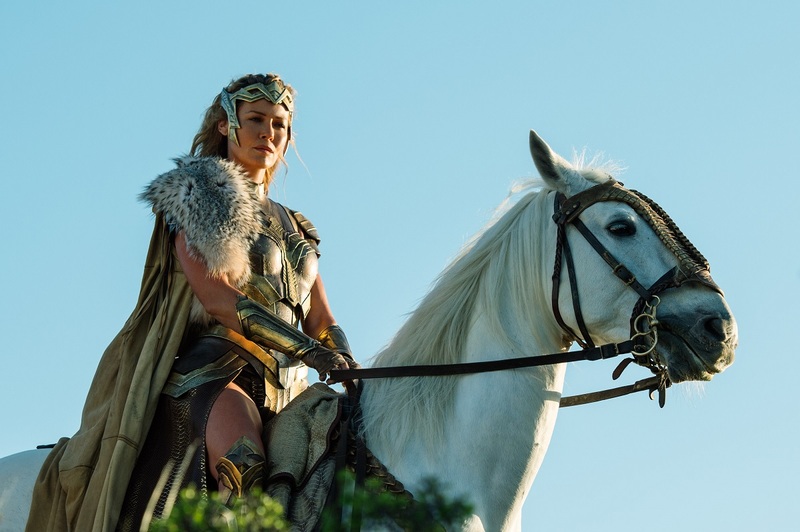 And, in the end, when Diana chooses to leave with the crashed pilot she rescued, Hippolyta meets her at the shore to say goodbye, and to give her a token of Antiope’s that will become part of her iconic costume. This time spent on Themyscira, observing the daily rhythms of its life, the beauty of nature that surrounds the Amazons, is felt over the rest of the film. We miss the sense of warm sea breezes blowing over spectacular sea cliffs as the film trudges through the muck of WWI. Curiously, that interest in older women doesn’t reach to the female villain of the duo behind most of the story’s mayhem. Dr. Maru (Elena Anaya) is a mad scientist who has disfigured herself in the pursuit of her work. The film flirts with her almost sexual arousal in the death she causes without letting her unfold into a malevolent force of nature that would be a worthy foil to Diana. Anaya’s most interesting moment happens at her look of confusion when Diana spares her life before she scurries away. But it’s that very disinterest in villains that underlines what makes the film so unusual and satisfying as a superhero story. Jenkins is much more interested in kindness and compassion. And those are traits Diana clearly learned on Themyscira. She is truly the daughter of the women who raised her, and it’s only by focusing on Nielsen and Wright in the first act does that come through so strongly. And after the macho posturing and cruelty of toxic swamps like “Suicide Squad” the idea that older women are heroes with their own lessons to impart is nothing less than radical. Comic book films have shown us aliens raised as Kansas farm boys. They’ve shown us cities ground into dust as characters pummeled each other through them. They’ve shown us snarky raccoons with machine guns and demigods fighting mad robots. But it took a woman director to look at a 51-year-old woman and see a hero capable of courage, compassion and sacrifice. To see her and see someone who could in a breathtaking moment leap through the air and fire three arrows at once. The hot take wars have already started over if “Wonder Woman” feminist enough. I don’t know if “Wonder Woman” is feminist, and frankly I don’t care. I do know that submitting stories and art to a pass/fail political test is a good way to ruin both. And putting “Wonder Woman” to that test obscures a much more interesting truth, and a much more profound one. “Wonder Woman” is a summer blockbuster that likes women. It likes us when we’re brave. It likes us when we’re frightened and overwhelmed. It likes us when we’re gentle and it likes us when we’re bold. It likes us when we’re little girls testing boundaries, and it likes us when we’ve grown watchful and wary from years of experience. And it matters a great deal that a woman was behind the camera. Because I don’t want characters like Hippolyta and Antiope to feel so rare. I don’t want performances like Nielsen’s and Wright’s to feel the exception. I want more. I want more stories about women made by women. Stories about WoC, about older women, about trans women. I want “Wonder Woman” to be the harbinger of possibilities. And if there is anything I am thankful to Jenkins’ film for its rekindling of the potential of summer movies. That rebirth stems from a director who is capable of seeing the possibilities in people our culture has trained us to ignore. And there are few things more wondrous than that.